The next time you walk down a sidewalk and come to a street crossing, you may notice some strange bumps and patterns in the concrete. I always thought these were for water drainage or extra traction. I was wrong! The real reason is much more complex and fascinating. In short, it’s to help people with disabilities get around a little easier. 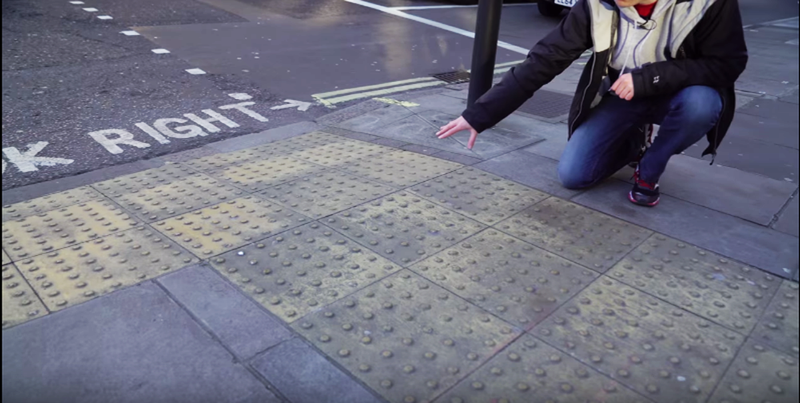 The following video is from the UK’s Royal National Institute of Blind People, and it gives an amazing explanation of not only why these patterns in the concrete exist, but also how the various patterns allow people with limited or no sight navigate the city safely. The integration of sidewalks and roadways in a major city is a massive undertaking for engineers who must take into account all kinds of populations, and how people with varying abilities will interact with the environment. My wife is a wheelchair user and we have traveled all over the globe. I can tell you from experience that the littlest details such has a flush curb cut (where the sidewalk meets the road) and an easy transition from one surface to another can either make a city easy to get around or a hazard. Those who don’t live with a disability, whether it be a mobility impairment or blindness, may never notice this complexity. But it’s necessary to design an infrastructure that promotes the safe transportation of all people.